Customer Thank You Christmas Wish List. Having been hit with flu as soon as I got back from Orlando, these are a little later going out than usual. Hopefully my lovely customers will forgive me! This is a project I have shared before, but I do love how I can take something very plain and make it sing! I get my Notebooks from my local Wilko, follow the link to see the original. They are really great value and reasonable quality, but they are very dull. Some Poppy Parade card and Santa’s Workshop Paper quickly sorts that out. Love them! Perfect for Christmas Wish List making. I do find that most notebooks like this are all very slightly different sizes, so it is best to measure each one before you start. The measurements I have given below are for the ones I used, so do be careful to measure yours. I measure the width, height and depth. The card should be cut to the width (or very slightly wider) of the book. My note book was about 1/4″ deep and 4″ tall, so I cut my card to 5″ to allow a good 3/4″ for the back. The key is to have more than enough on the back to cover the tape holding the book together. I love the Santa’s Workshop Suite, but am aware that some items may become unavailable soon. We have been advised by Stampin’ Up! that once they are gone, they are gone, so if you want to add a few mischievous elves to your Christmas Crafting, don’t hang about, get them ordered very soon. If you order from me during November AND use the Host Code, you could win a set of Many Marvellous Markers worth £112.75! For every £30 you spend in my online store AND use the Host Code, you will get an entry to the draw to win this great prize. For the draw only, you will get an entry for EVERY £30 you spend, even if that is over more than one order. This will NOT change how you earn Sunflower Rewards (details below). 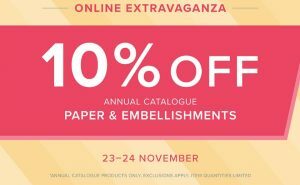 Don’t forget that today is Online Extravaganza Day for all your Paper and Embellishment needs from the Annual Catalogue. Don’t miss out on those bargains. The Starter Kit is ALWAYS the best deal in the Catalogue and great value at just £99 for your choice of £130 of products (with no additional P&P). As a Member of this great Family, you get a minimum of 20% net discount on your future purchases. You also get income from sales you make to other people if you want to use this as a business. Win,Win Right? 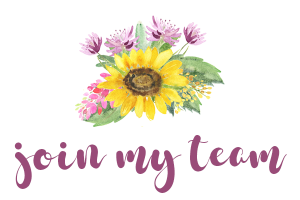 Just click on the picture to join the Team. If you decide that being part of the Stampin’ Up! Family is not for you, then just stop buying and you will revert to being a customer. Easy, simple, no quibbles! « The Online Extravaganza is Here!